Everytown for Gun Safety, Michael Bloomberg’s anti-gun group, is taking on the NRA and winning. It still exists—and it’s starting to work. 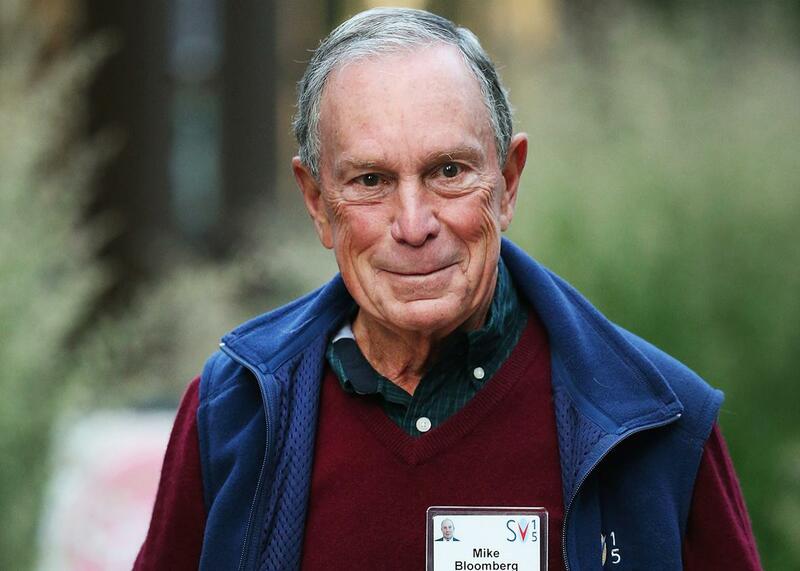 Michael Bloomberg, former New York City mayor, attends the Allen and Co. Sun Valley Conference on July 9, 2015, in Sun Valley, Idaho. The two weeks that followed the Orlando nightclub massacre seemed to give advocates of stricter gun laws reason for hope. First, Democratic lawmakers in the Senate staged a dramatic filibuster, demanding that a set of bills aimed at keeping guns away from dangerous people be brought to the floor. A week later, Democratic members of the House held a 25-hour sit-in on the floor of that chamber, a public protest that shattered the norms of congressional procedure and suggested a new civil rights movement—one aimed at ending gun violence—was in the making. For those who want to see legislative movement on the gun issue, it was natural to feel excited by these events in the moment. But it’s now just as easy to feel deflated by their failure to produce any real change. The measures proposed in the Senate were rejected in a vote that was as perfunctory as it was inevitable. The House, meanwhile, adjourned for its Fourth of July recess after Speaker Paul Ryan dismissed the sit-in as a “publicity stunt.” Ryan has since indicated the House will vote on a bill, but it’s likely to be one that gun control advocates consider all but meaningless. In the end, the twin spectacles that shook Capitol Hill in the aftermath of Orlando have served as a reminder of just how little has changed since the December 2012 shooting at Sandy Hook Elementary in Newtown, Connecticut. For the second time since Adam Lanza fatally shot 20 children and six adults, members of Congress responded to a mass murder by trying to improve, modestly, America’s gun laws, and for the second time, they have been soundly defeated. This outcome might be less disappointing were it not for the fact that the last time the gun debate reached such a fever pitch, one of America’s richest and most powerful men stood before the nation and promised that progress was coming. Where has he been in the intervening years, and what has become of his optimism? In the spring of 2014, Michael Bloomberg, then three months removed from his final term as mayor of New York City, declared his intention to wrest control of gun policy away from the National Rifle Association. He would do so by setting aside $50 million of his personal fortune to create an ambitious new advocacy organization called Everytown for Gun Safety. For the first time since the NRA became a force for hardline gun policies in the late 1970s, the group would have a formidable, well-funded opponent—one that would systematically work against the NRA’s longstanding efforts to intimidate lawmakers into supporting its absolutist agenda. “We’ve got to make them afraid of us,” Bloomberg told the New York Times. More than two years after Everytown’s launch, in the wake of the worst mass shooting in modern American history, it’s fair to wonder what Bloomberg and the organization he started have been up to—and what they have to show for their efforts. With this latest act of violence, and the latest squelching of reform in Congress, it’s easy to assume Everytown has been a failure, and to worry about what that means for the future of the gun debate. In fact, Bloomberg’s organization is at the center of what can legitimately be called a new American gun control movement—one that experts say has already begun to demonstrate, in the years since Newtown, that the NRA is not the invincible force many assume it to be. There are reasons why Everytown’s efforts have not received wider notice. The group’s agenda is aggressively moderate, even cautious, and it has adopted an unapologetically incrementalist strategy in which racking up small victories at the state level is prioritized over waging unwinnable wars in Congress. Like other gun reform groups, Everytown has also made a point of describing its mission as “gun violence prevention,” not gun control, a term that has come to be seen as politically radioactive. The leaders of Everytown believe this slow and steady approach is the only way to defeat their entrenched foes in the gun lobby. Not everyone agrees it’s enough. Everytown’s strategy—and the dominance it enjoys on account of its resources, its national network of members, and its media profile—has created tensions with groups that should be its natural allies. Members of some state-based organizations have felt bulldozed by Bloomberg’s big machine, while some veterans of the cause, who remember a time when it was still acceptable to question the individual right to bear arms, worry that Everytown’s politically restrained platform has curtailed the ambitions of the broader gun control movement. But the victories Bloomberg’s group has secured in the past two years, while seemingly modest, should encourage and intrigue anyone who has despaired at the unbreakable grip the gun lobby has had over American lawmakers. The organization may only be taking incremental steps thus far, but they may be the first steps on a path that leads to eventual change. Goss noted that her 2006 book was called Disarmed: The Missing Movement for Gun Control in America. “I would not say that movement is missing anymore,” she said. A key part of Everytown’s plan is to prove to politicians who want to vote for gun safety laws that they no longer need to fear the NRA. Of course, the deep-pocketed gun rights group can still be expected to pour resources into removing lawmakers from office in retaliation for their disobedience. But now there is money on the other side of the issue too, money that can give candidates cover to support gun law reforms by protecting them from NRA-funded attacks. Everytown also wants lawmakers who stand in the way of reforms—including Democrats—to know that doing so now comes with consequences. The first big test of Everytown’s political power came with the 2014 midterm elections, which took place just a few months after the organization formally opened its doors. Everytown’s priorities included a ballot initiative in Washington state calling for an expansion of background checks to include nearly all gun purchases. Thanks in part to the $3.5 million dollars Everytown invested in promoting the initiative, it passed by a wide margin. Another battleground in 2014 was Colorado, where the gun lobby had spent aggressively to recall two Democrats who voted the previous year to support background checks for private gun sales and a limit of 15 rounds for ammunition magazines. The midterms saw both seats go back to Democrats who supported gun control, including one who had worked for Bloomberg as a coordinator at Mayors Against Illegal Guns. Such victories must be viewed in context. Last October, Maine made it legal to carry concealed weapons without a permit despite an advertising assault from Everytown. The following month, the organization spent $2 million in a failed attempt to help Democrats win a majority in the Virginia State Senate—a defeat that was compounded this past January when Everytown’s onetime ally, Virginia Gov. Terry McAuliffe, came out in favor of an NRA-approved bill that expanded the rights of concealed-carry permit holders. More broadly, as the Law Center to Prevent Gun Violence has reported, there were roughly as many states that weakened their gun laws in the two years after Newtown as strengthened them. Arkadi Gerney, a senior fellow at the Center for American Progress and the former head of Mayors Against Illegal Guns, says that to dwell on that fact is to forget what the landscape for gun control laws looked like throughout most of the 2000s. It’s not just that fewer people own guns. Polls have repeatedly shown that the vast majority of Americans are in favor of universal background checks. Even NRA members, when responding to independent surveys, overwhelmingly support closing loopholes for gun show purchases and private sales. The problem, said Spitzer, has always been that, unlike people who support common sense gun law reforms, those who believe in gun rights believe in them fervently and unequivocally. The intensity of their feelings has made it possible for the NRA to mobilize them in elections even though they represent only a fraction of the population. Pitted against the NRA’s highly motivated base, in other words, the majority of Americans who support universal background checks have historically been doomed to political impotence despite their large numbers. The challenge before Everytown is to convert some of those people into voters who will never consider supporting a candidate who disagrees with them on guns. Getting people to vote based on their gun control views will be necessary in order for Everytown to make good on its intention of showing lawmakers that they can win on the issue. As evidenced by the fights the group has lost so far, success is far from inevitable. Everytown’s commitment to moderate reforms seems like it should make for a big tent. After all, the cause it promotes most frequently—requiring background checks for all gun sales—enjoys broad support precisely because it’s so hard to disagree with. But moderation is also less likely to inspire the kind of passionate engagement the NRA manages to inspire when its leaders speak of freedom, culture, and constitutionally protected rights. The dilemma was recently crystallized by Yale’s Benjamin Miller, who co-authored a paper in The Lancet reporting that, while 77 percent of respondents to a national survey said they supported a federal law mandating universal background checks, 41 percent believed there was already one in place. “My best guess as to why people make this assumption is that it just seems like a reasonable thing,” said Miller. “Like, why wouldn’t we have that?” It’s hard to win support for common sense gun laws when voters’ common sense tells them the laws already exist. Despite this challenge, Everytown remains committed to these types of poll-tested reforms over ones that don’t enjoy as much support but are arguably bolder and more exciting. “We do things based on what’s realistic and what’s effective,” said Shannon Watts. Case in point, Everytown is declining to support a ballot initiative in California scheduled for the fall that, among other things, will include a ban on large-capacity magazines typically used in assault weapons. But how slow is too slow? Everytown can point to the local victories it has won thus far as proof that the organization can successfully do battle with the NRA. But the emotional resonance of those victories is undeniably limited, especially at a moment when mass shootings continue alongside spikes in gun violence in cities like Baltimore and Chicago. It’s easy for an outside observer to view Everytown’s victories as drops in a bucket. Multiple longtime gun control advocates I spoke to for this story said they wished that the centrism favored by Everytown was being challenged from the left by more demanding voices—activists who would be unwilling to concede the sanctity of the Second Amendment, for instance, or accept the premise that the cultural values of hunters must be respected at the expense of 30,000 lives per year. Ladd Everitt, a spokesman for the Coalition to Stop Gun Violence and one of the few gun control advocates I found willing to voice this opinion on the record, said there is a need for more radical voices in the gun control movement to serve as a counterweight to the NRA’s uncompromising platform. “You have to understand that the NRA is a far more radical organization than Everytown. … By having so many extreme, absolutist voices, they consistently move the middle in their favor,” said Everitt, explaining that today’s definition of “common sense” gun policy only seems that way when you compare it to the NRA’s vision of making guns accessible everywhere all the time. Everytown isn’t stopping its allies from pursuing a more aggressive agenda. But the influence the organization enjoys thanks to its staffing, its facility at getting media attention, and above all, its access to Bloomberg’s fortune, gives it the power to define the terms of the debate. On June 21, Everytown held a press conference in Washington, D.C., to address the previous night’s Senate vote and offer a hint about its battle plan for the 2016 election. In addition to mentioning the organization’s plans to support background check ballot initiatives in Nevada and Maine, Chief Strategy Officer Brina Milikowsky emphasized Everytown’s endorsement of Hillary Clinton, who has been speaking out about guns on the campaign trail in a way that Democratic presidential candidates have not in previous elections. In light of this shift, Everytown is planning to invest heavily in supporting Clinton while hoping to inflict damage on vulnerable members of Congress—like New Hampshire Republican Kelly Ayotte—who have voted against expanded background checks. Still, its focus will remain on the states, where it is common for Democrats in conservative districts to vote with the NRA (and where some Republicans representing more moderate constituencies vote against it). The NRA didn’t respond to a request for comment, but it’s safe to say its leaders will have a better idea of what to expect from their upstart challenger than they did in 2014, and may come better prepared. Even if Everytown can’t yet match its rival’s resources, however, for the first time in 40 years, the battle over gun laws is now something like a fair fight.